This month’s soap challenge was negative space embedding. 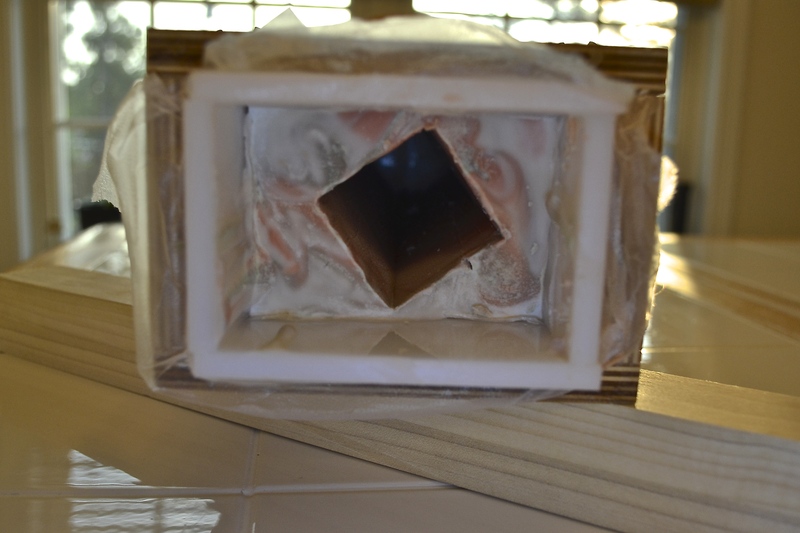 The idea is create a soap that will have holes in it (negative space) that are then filled with a different soap. 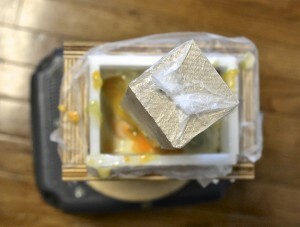 Typically embeds are made first and inserted into freshly poured soap. I decided to use my vertical mold because I wanted to be able to cut the soap with my wire soap cutter as I am challenged when it comes to cutting a straight soap. Also I thought it might be easier to just have one space to fill. I choose a piece of 2×2 wood that I had and cut it longer than the mold so I could have a good grip when I tried to pull it out of the soap. Amy had mention that she had trouble getting the pipes that she used out of the soap. At the last minute I had the brilliant idea (if I must say so myself) to cover the wood with Press’N Seal to help with removal. The bright orange you see is actually yellow and will turn back to yellow. I am using a blend of citrus essential oils and plan on call this “Critus Blast”. This section is green and yellow for lemon, grapefruit and lime. The wood was easy to remove, leaving the Press’N Seal behind. The wrap pealed off in a snap leaving a nice “negative space”. The colors I wanted to use were yellow, pink, orange and a little green. The plan was to pour two colors at a time in to alternate corners. I had visions of free flowing soap forming beautiful swirls. Unfortunately my soap got thick and I had to force it in the opening. I did still try to alternate the colors but……. With so little soap in the negative space, the soap did not gel and the colors are not as vibrant as they could have been with gel. There are also some air bubbles in a few slices but not too bad. While the design didn’t work out as planned it is still a fun soap and it smells incredible. In addition to lemon, lime and grapefruit that I mentioned earlier I also used blood orange, sweet orange, and tangerine. For fun I tried another version of this technique. 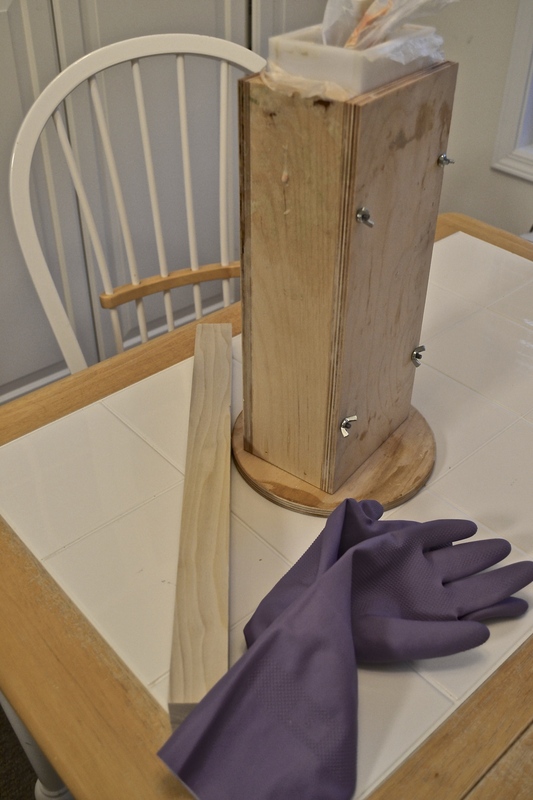 This time I used a regular loaf mold and round PVC pipe. 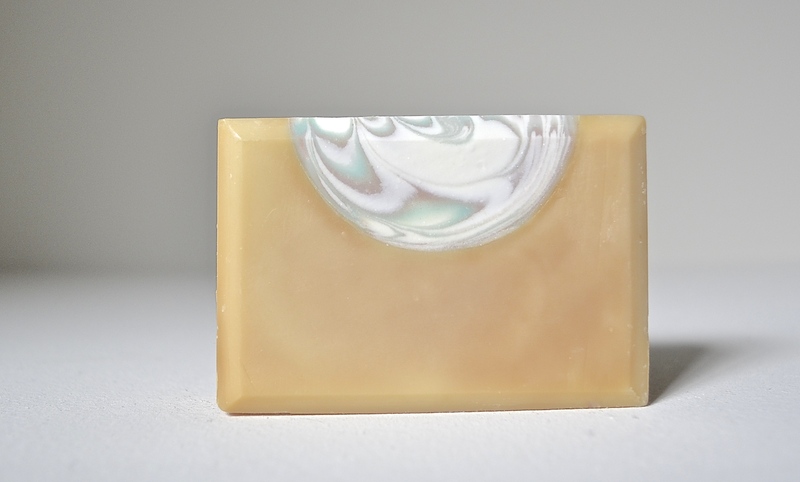 The fragrance I used was Cashmere and Silk which discolors to tan so the soap used in the negative space was left unscented. White, teal and pink were used to complement the tan – also they are the colors of a cashmere sweater I once saw and loved (too bad I couldn’t afford it at the time). This one required a horizontal cut to see the swirl in the negative space. You can see the top is already starting to turn. A fews days later and it is darker but still not as dark as it will get. I usually steer away from discoloring fragrances but this one is definitely worth it. Which one to post as my entry? Decisions, decisions. I wish the Cashmere and Silk had time to darken – I know it is going to look great. But maybe if I thought about it I could have found a way to make sure Citrus Blast gelled. A huge thanks to Amy for organizing these challenges. This was especially fun since I would not have tried this technique without the challenge. Awesome I like both, but your entry is my favourite. Love both, but the round swirl is amazing — looks like a pearl! Both entries are amazing & I love that you have also photographed the process. I really like the simplicity of the second soap, although both are beautiful. 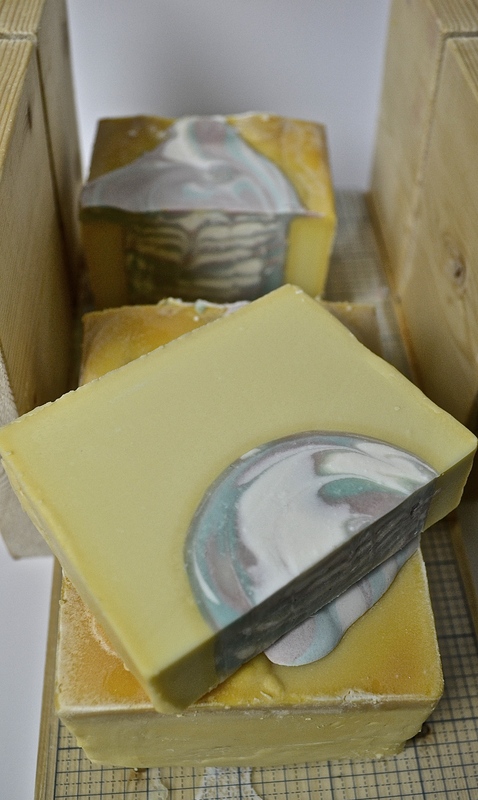 You’ll have to post another photo after it darkens – the negative space soap really pops against the base color! Your soaps turned out beautiful. 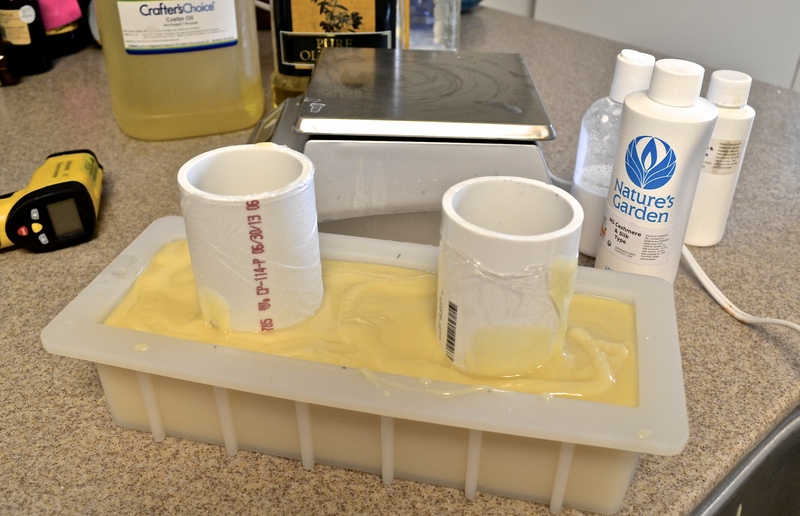 I ran out of time and wasn’t able to make my soap for the challenge…..now I’m happy I didn’t…lol. You have given us all a wonderful idea with the tube mold idea. 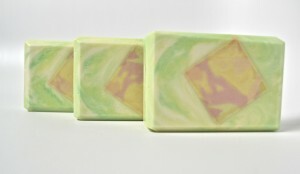 Beautiful soaps!!! I am sure that your soap would have been awesome. But there have been a few challenges when I ran out of time too so I understand how that happens. Actually looking at all the great entries, I am wondering if I might not have been better off if I ran out of time on this one. Both soaps are stunning, Bonnie – but I think you chose the right one to enter. And your use of the wood in your first soap made me smile, because while searching for objects to pour around, I tried raiding DHs workshop ….. but couldn’t find any suitably sized pieces! Awe – thank you. I don’t have a DH and the workshop is mine. You comments made me smile ear to ear. Most people can’t believe that I like to use my saws and even more I absolutely love the smell of sawdust. Both are nice, but I especially like the one you chose for the entry. Simply beautiful! It does look like a pearl – absolutely beautiful! 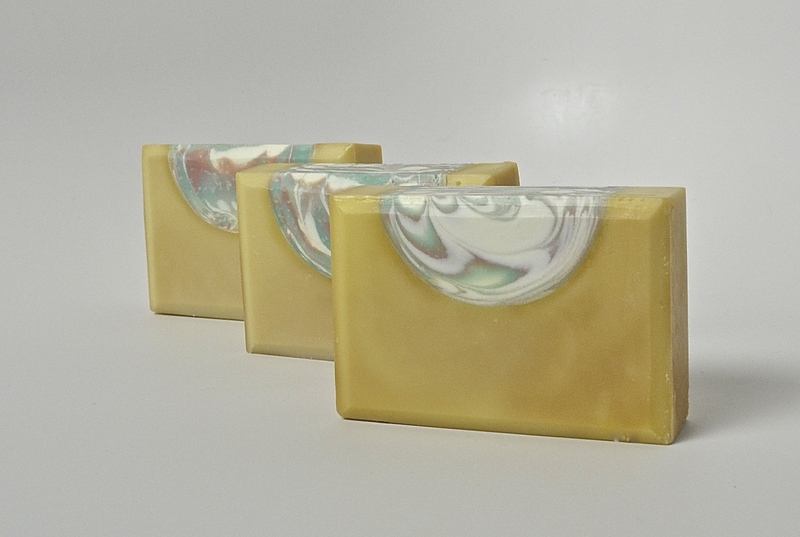 Thank you for sharing how you made the soaps. The rectangular column is a great idea. 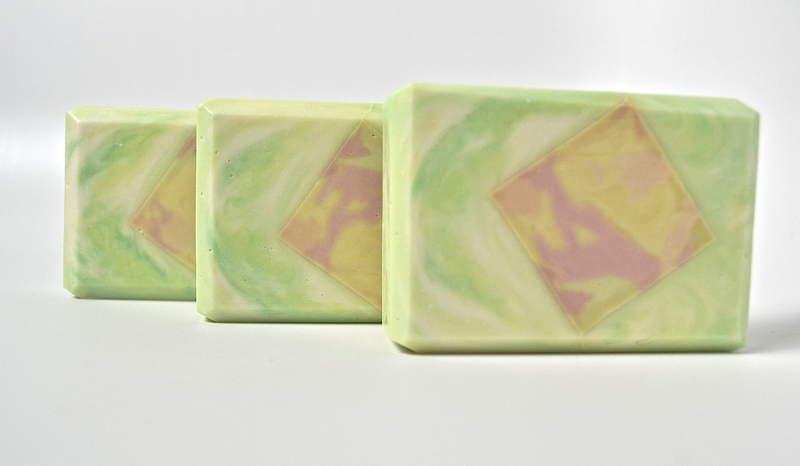 The colors of the first soap are beautiful and the pear-like negative embed is great, too. It looks so very delicate, just like a real pearl. I never thought of using wood, what a cool idea. I would also love to see photos of the soap you entered once the colour darkens. It’s already really pretty. Your entry is fabulous. Good luck =) And nice work on doing two batches!